The drop-in session due to have been held on Wednesday 28 February was cancelled because of the deluge of snow. Following the recent adverse weather and the cancellation of the Jura Street Active Travel consultation. The event has been re-scheduled for 27th of March 2018. The event shall take place at the Palace of Art, Bellahouston Park between 3pm and 7pm. In addition to this the online consultation (currently active) will remain open until the 6th of April 2018. Members of the public are directed to www.glasgow.gov.uk/jurastreet in order to view drawings and provide feedback. Do get along if you can, and do have a look at the on-line information and respond. We hear that the Byres Road design and stakeholder consultation is progressing and we hope to hear about the next phase of consultation soon. 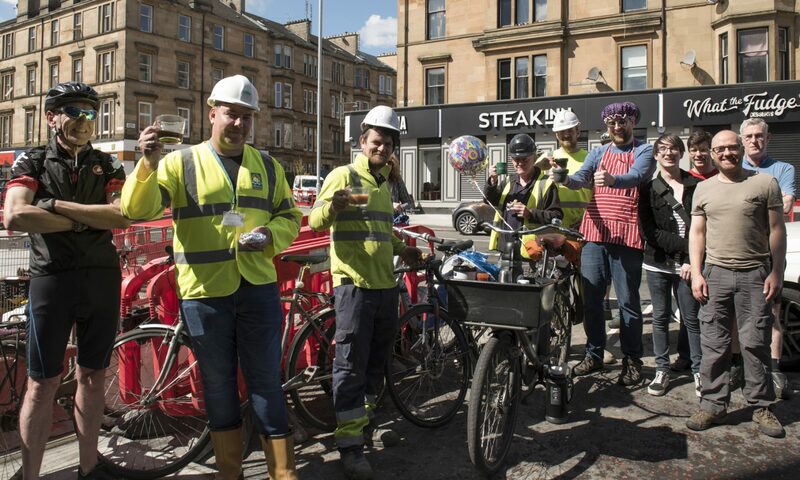 In the meantime, well done to all those people who turned out on their bikes on 25 February and to the City Councillors who met them to discuss what is needed to make Byres Road an active travel success. Just in yesterday, confirmation that a contraflow cycle lane is to be constructed on Burleigh Street, Govan. “The Order was made on 23rd February 2018 and an advert was placed in the Evening Times on 2nd March 2018 stating that the Traffic Regulation Order has been made.” We first heard about this at the end of June last year and queried some of the arrangements for the demarcation of the pedestrian and cycle lanes. At the time we were sent this cross-section: Burleigh Street Govan and while this was a draft we understand the contract has now been let, with construction along the lines of this drawing, to proceed over the next few months. So, a fairly quiet fortnight, not much cycling either, but it’s bound to pick up. Next PostNext International Women’s Day… and Cycling.